All blockchain transactions incur network or miner fees. 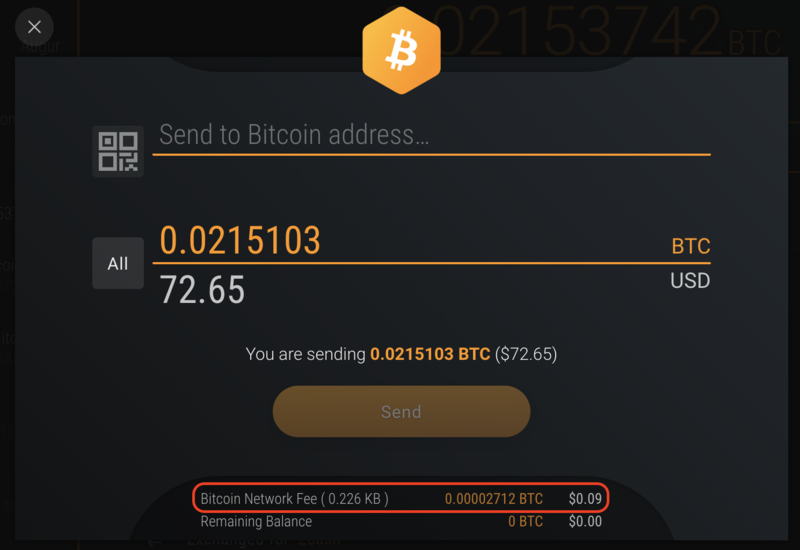 Other than the fees that go to the network, Exodus does not charge fees for sending or receiving. Unlike exchange platforms, Exodus does not keep any of the transaction fees charged for withdrawing bitcoin (BTC), Ethereum (ETH) or any other cryptocurrency. The use of any blockchain network (Bitcoin, Ethereum, etc.) requires a small fee to send a transaction. This is because there are people (called miners) who are constantly spending resources like computing power and electricity to help process and secure all transactions on the network, transaction fees go to them. These fees do not go to Exodus, they are paid in full to the network (miners) to ensure transactions are delivered reliably and quickly. Popular networks are crowded and thus more expensive. Today, Bitcoin is the most popular network and has the highest fees of any digital asset supported by Exodus. Blockchain networks use fees to make it hard for any one user to flood the network with junk transactions causing others to have to wait. If sending transactions were free, one bad actor could damage the network speed and reliability for everyone by spamming the network with a lot of tiny transactions. Fees, in this respect, are one of the many incentives created by the Bitcoin Protocol (and most other blockchains) to make it secure. Bitcoin Fees are typically measured in Satoshis (Bitcoin's smallest unit) per Byte or Sats/b. The more information (bytes), the more Satoshis (bits of BTC) you will have to pay. The amount of information in a transaction does not depend on the amount sent, but on the number of previously received deposits. A transaction's size is dictated by the number of inputs and outputs. The more inputs you have, the more expensive the transaction. This is why people that mine BTC and receive a lot of small payments tend to have much larger transaction fees. One of the easiest ways to think about this is with change and dollars. One dollar is the same as 100 pennies, however, it requires more work to count 100 pennies and give it to someone for payment than it does to hand over a one dollar bill. Alice receives 0.01 bitcoin every day for 100 days. Bob receives a payment of 1 BTC once. Both Alice and Bob now have a 1 bitcoin balance. If Alice and Bob now try to send 1 bitcoin, Alice will have to pay a much larger fee than Bob. This is because the Bitcoin Network has to process a lot more data with Alice's transaction bundling all of her small “inputs” together vs. Bob who just has 1 input. This is similar to a person who tries to spend 100 pennies vs. a one dollar bill. Both have the same value, but the 100 pennies are much harder to count, it takes a lot of effort to process them and make the transaction. This only affects BTC and other UTXO-based currencies like BCH, BSV, BTG, LTC, DGB, etc. Ethereum and other Non-UTXO-based assets have a different fee calculation system, based on the type of transaction being sent. For example, you will pay a larger fee (GAS) if sending to a 'smart contract' address, or if sending an ERC20 (Ethereum based) token than if you send Ether (ETH). Something important to keep in mind is that Exodus will calculate and set fees automatically.